He's talking about Barbara Ehrenreich, leftwing writer and author of Nickel and Dimed a good piece of work. Although I like some of her work I have issues with Ehrenreich. She's a Berniebro. She has idiotic ideas about the reason smoking was banned in New York City parks. But unfortunately for Singal, Ehrenreich doesn't agree with him about evolutionary psychology and The Bell Curve. This is not the first time I've asked concerning the output of an evo-psycho bro: do they read the work they cite? He links to an article Ehrenreich wrote in The Nation, twenty-one years ago. Please note the darker yellow section I highlighted. So no, Singal, she's not on your side. She called The Bell Curve "pseudo-biology." The failure on the part of journalists to seriously engage with the claims of evolutionary psychology is a constant. The failure is either because the journalist is already in the tank for evolutionary psychology, in the case of Singal, or they are intimidated by all the science talk. Here is a link to the New Yorker's review of Better Angels by Elizabeth Kolbert. It's almost as perfect a take-down of Pinker's idiocies as Louis Menand's review of The Blank Slate. The Bell Curve is even more disingenuous in its argument than in its obfuscation about race. The book is a rhetorical masterpiece of scientism, and it benefits from the particular kind of fear that numbers impose on nonprofessional commentators. It runs to 845 pages, including more than a hundred pages of appendixes filled with figures. So their text looks complicated, and reviewers shy away with a knee–jerk claim that, while they suspect fallacies of argument, they really cannot judge. In the same issue of The New Republic as Murray and Herrnstein's article, Mickey Kaus writes, "As a lay reader of 'The Bell Curve,' I am unable to judge fairly," and Leon Wieseltier adds, "Murray, too, is hiding the hardness of his politics behind the hardness of his science. And his science, for all I know, is soft.... Or so I imagine. I am not a scientist. I know nothing about psychometrics." And Peter Passell, in the Times: "But this reviewer is not a biologist, and will leave the argument to experts." The book is in fact extraordinarily one–dimensional. It makes no attempt to survey the range of available data, and pays astonishingly little attention to the rich and informative history of its contentious subject. (One can only recall Santayana's dictum now a cliché of intellectual life: "Those who cannot remember the past are condemned to repeat it.") Virtually all the analysis rests on a single technique applied to a single set of data—probably done in one computer run. (I do agree that the authors have used more appropriate technique and the best source of information. Still, claims as broad as those advanced in The Bell Curve simply cannot be properly defended—that is, either supported or denied—by such a restricted approach.) The blatant errors and inadequacies of The Bell Curve could be picked up by lay reviewers if only they would not let themselves be frightened by numbers—for Herrnstein and Murray do write clearly, and their mistakes are both patent and accessible. I think this explains, at least partially, how Pinker has gotten away with supporting the careers of professional racists for over twenty years. 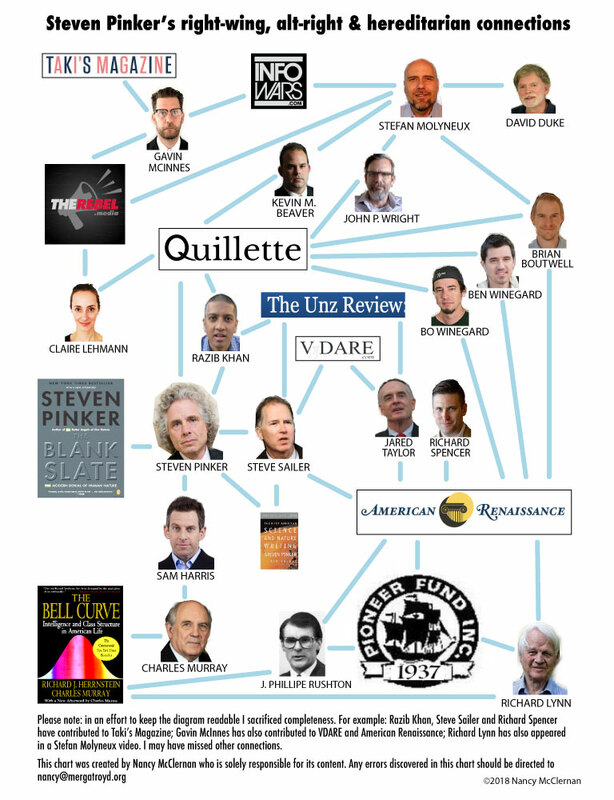 There is a direct connection from The Pioneer Fund to J. Phillippe Rushton (who served as its president) to Steven Pinker who consistently promotes the work of Rushton and to the next generation, the proponents of "human bio-diversity" being groomed by Quillette, the Winegard bros.
And yet you still find journalists like Singal parroting the right-wing line that the only problem with evolutionary psychology is political correctness.